The heart of every mechanical vapour-compression refrigeration system is its compressor. Like the human heart, the refrigeration compressor is a pump that keeps the system’s essential fluid circulating. And like the human heart, if we want the system to keep operating for many years, it pays to treat its central component with care. There are five main types of compressors: reciprocating, screw, rotary, scroll and centrifugal. Industrial freezing and cooling systems normally employ either reciprocating or screw compressors, so we’ll focus on those types — especially the reciprocating compressor. Reciprocating compressors are used in small and medium-sized refrigeration systems, and like gasoline engines they employ cylinders, pistons, connecting rods, crankshafts and valves. The valves, unlike those in an engine, open and close by themselves in response to cylinder pressure changes. The reed or flapper valves shown in the diagram are one common type; spring-loaded ring valves are another. On the intake stroke, the system’s “high-side” pressure closes the output valve, and the falling cylinder pressure opens the intake valve. On the compression stroke, rising cylinder pressure closes the intake valve. 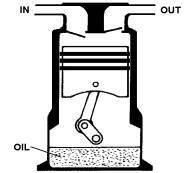 Then, near the end of the stroke, high pressure within the cylinder forces the output valve to open. Some reciprocating compressors use splash lubrication, as show here. High-capacity units usually have shaft-driven oil pumps and pressurized lubrication systems. Reciprocating compressors come in open, serviceable-hermetic, and welded-hermetic housings, with the open and serviceable-hermetic designs preferred for industrial systems because they can be repaired and overhauled locally. Screw compressors, also known as helical rotary compressors, are used in large refrigeration systems. These compressors utilize two meshing helical rotors (a male one with lobes, and a female one with gullies) in a close-fitting housing. The interleaved rotors force the refrigerant fluid forward from input to output. The male rotor is normally motor-driven. In “dry” systems the female rotor is also driven. In “oil-flooded” systems, contact with the driven male rotor is, by itself, sufficient to turn the female rotor. The amount of useful refrigeration that a compressor delivers for a given amount of mechanical drive energy depends on both compressor design and system operating conditions. In reciprocating compressors, the compression stroke does not completely empty the cylinder of compressed gas. Some gas remains in the cylinder, and on the next intake stroke it re-expands and mixes with the gas being brought in. Those compressor designs that empty more completely tend to be more efficient. Compressors, like engines, eventually wear out, and the internal wear of piston against cylinder, and valve against valve seat, eventually cause compressor efficiency to decline. In addition, compressor performance can be adversely affected by problems in other parts of the system. Reduced condenser air flow can also cause this ratio to increase. Excessive condenser temperature causes head pressure to rise. This causes more refrigerant to be squeezed into that efficiency-reducing clearance space at the top of the cylinder, and lowers compressor efficiency. A dirty evaporator plus a dirty condenser can lead to compression ratios of 15 or higher — resulting in long compressor run times, increased energy expenditure, and the potential for compressor damage. In general, operating with the highest suction pressure and lowest head pressure that meets your refrigeration needs will maximize both compressor life and compressor efficiency. Refrigeration compressors are designed to pump gas, not liquid. Serious evaporator air-flow problems and some TX-valve problems can cause liquid refrigerant to enter the compressor. Liquid refrigerant is not compressible, and if a reciprocating compressor tries to pump too much liquid, too fast, pistons, valves, and connecting rods can bend or break. If proper lubrication is not maintained, compressor damage will occur. Most large compressors depend on oil pump control systems to maintain proper oil pressure, and inappropriate settings can lead to lubrication failure. Note, also, that changing refrigerant from the ozone-depleting CFC type to a non-polluting replacement often requires a change in the type of lubricant. 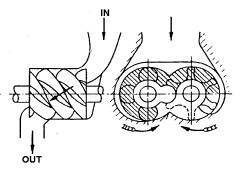 With belt-driven compressors, care must be taken to align the pulleys properly. Also, where multiple belts are used, they should be bought in matched sets. Where the motor drives the compressor directly, proper alignment is even more critical if premature bearing failure is to be avoided. 1. Monitor head and suction refrigerant pressures, calculate the compression ratio, and make sure it does not rise to unacceptable levels. 2. Keep the evaporator clean, and make sure frost and physical objects do not obstruct the air flow. 3. Keep the condenser clean, and make sure condenser air flow is not obstructed. 4. Keep watch on compressor lubrication, including periodic checks of the oil pump control system. 5. Maintain proper compressor/motor drive alignment. For further information about operating industrial refrigeration systems in an energy-efficient and cost-effective manner, contact Ron Estabrooks or Mike Proud at 1-800-236-5193 (toll free).